Not too many people start off their music career by sharing the stage with Green Day, but that's just how Melia's journey began. After begging her parents to let her take guitar lessons, they finally gave in and she started to play at the age of 16. The first time she was inspired to play guitar occurred while watching a Green day Concert. It's fitting that after dedicating herself to practicing guitar 6-8 hours a day she was picked to play "Jesus Of Suburbia" onstage at the next Green Day Concert she attended. You can watch that video below which concludes with her doing a stage dive. Melia joined her first band in high school and took up vocal duties as well as guitar since the band lacked a singer. Dedicated to always improving, Melia began to take vocal lessons. She recorded and released the album Soundproof Walls in 2011 which spawned the video below. Melia began playing shows wherever she could and picked up gigs with several famous acts. She has played with The Offspring, Eve 6, Gaslight Anthem, Our Lady Peace, Walk The Moon, Oberhofer, The Tea Party, Thousand Foot Krutch, Love and Death, Big Wreck, Steve Vai, Twenty One Pilots, New Politics, Fuel, Sick Puppies, Black Star Riders, Asia, Chevelle, Lacuna Coil, The Misfits, Buckcherry, Otep, Drowning Pool, Saliva, Lita Ford, Adam Gontier, Daughtry and Halestorm. You can see the guitar solo she performed when she opened up for Steve Vai in the video below. The need to play, practice, and improve has always been a a focus for Melia. She even had three guitar lessons with legendary guitarist Jennifer Batten to hone her skills. In 2015 the follow up EP to her debut was released. 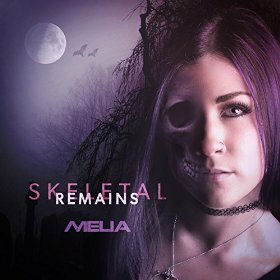 Skeletal Remains contains four tracks, one of which was used for her latest video, "Bats Beneath Moonlight" (below). With her ability and drive it'll be interesting to see what the next few years holds for Melia. You can become part of the journey by following her on Facebook and Twitter. Be sure to stop by her website and pick up some merch to help her along.